Welcome to 'I Delfini' on beautiful St. John, US Virgin Islands; the perfect choice for the discerning Caribbean traveler, seeking a taste of island living at its finest. Our vacation rental is newly remodeled and stylishly furnished, offering spectacular views of the blue Caribbean, along with sunset performances that are frequently stunning. Conveniently situated just 3 miles from the main town, we are also discretely off the beaten track to provide the perfect, peaceful respite for some R&R, island style. We are fortunate in having a couple of pleasant beaches nearby. Additionally, we are surrounded by green space and just a short jaunt to National Park Service trail heads. The idyllic setting, overlooking Fish Bay and a pristine nature reserve, takes full advantage of the islands natural amenities at their very best. Sleep to chirping Coqui frogs and wake to chattering Bananaquit birds. Don’t forget the breathtaking views from every angle! The large private deck is a great spot for at home BBQ's or a happy hour cocktail after a day on the beach. Other comforts include free WIFI internet, newly renovated teak kitchen, gas grill and on-site parking. The kitchen was upgraded just a few years ago and the bathroom was remodeled in 2014. Owner owned and operated, “I Delfini” will be everything you could hope for; an absolutely delightful (and WARM!) break from reality. You won’t be disappointed. Roku with access to Netflix. Just spent an amazing 2 weeks at I Delfini on Fish Bay in St. John. It was just as pictured..only better. The view was amazing and the apt. was clean and tastefully decorated and attentive to detail. Even came to tidy up the apartment mid stay. Convenient to Cruz Bay and the beaches. The best part were the owners, Katha and Vezio. They were very charming and friendly and always left you to your privacy. Would definitely stay at their place again. Took a bit to get used to left side driving and cliffside driving but totally loved St. John. It was such a special place, the view was amazing! Sitting outside in the morning having coffee was a wonderful experience. Katha was wonderful and made sure we had everything we needed. It was so great to return to St. John. Will be back soon!!! 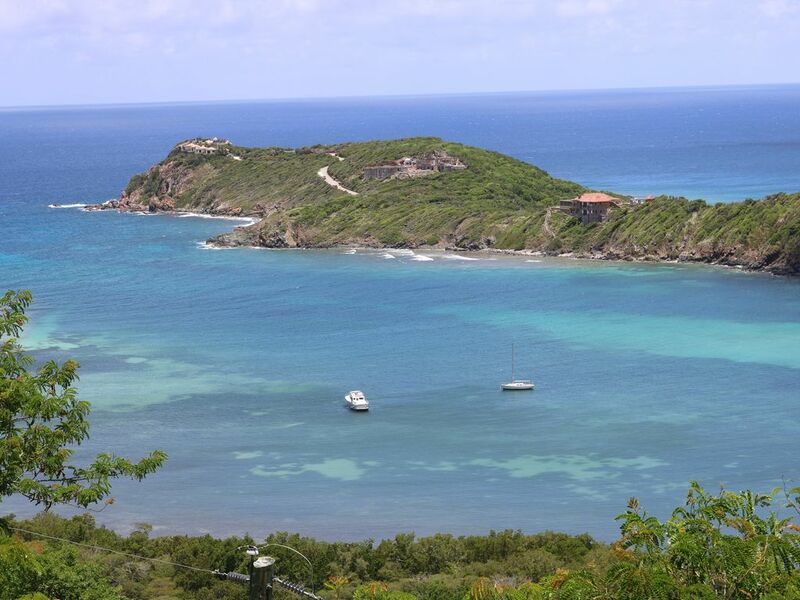 This was one of the nicest places we have rented on St John. We spent two weeks here. Our hosts made it very comfortable. We had everything we needed ... beach towels, beach chairs, snorkeling gear, cooler, ice packs etc. The kitchen had every appliance and gadget imaginable. We didn't have to purchase water which was a great convenience because they have triple filtered water. There is also a nice deck with umbrella, lounge chairs, etc overlooking beautiful water views. The most memorable part of our trip was the kindness we received from our truly amazing "hosts". We highly recommend this very special home. You are too kind! Thanks for the sterling review and for choosing “I Delfini” for your Caribbean respite. We loved having you and look forward to your next visit... soon come! Here’s hoping everyone is warm, healthy and happy on your side. Beautiful Place! Great Hosts! Exceeded our expectations! Katha and Vezio’s home was everything we could have asked for and more. Very clean, and spacious with all the amenities we needed! The view was UNBELIEVABLE! Katha and Vezio went above and beyond to make sure we were enjoying our stay, without invading our privacy! I can’t recommend the rental enough. We will definitely be back! Property and furnishings were everything we needed and more. Kitchen was nicely equipped and deck with a view was legit. Hosts were extremely accommodating. Felt like we were staying with old friends. Our hosts were amazing and welcoming! We loved our accommodations and would definitely return! What a great find, a comfortable and relaxing space with extra amenities that made a big difference! The space was perfect for the two of us with a well equipped kitchen and a gorgeous view! No need to buy bottled water as their tap water is extra filtered and they also allowed us to borrow lunch bags and ice packs which made packing luches a breeze. Just far enough from Cruz bay to still be convenient but away from the huddle and bustle. We highly recommend and would not hesitate to return! Loved having you two ; ). Hope to CU again in the near future. Thanks and Happy New Year!